Bassett et al (2015) just published a paper in Journal of Genetics & Genomics on constructing a genome-wide CRISPR library for high throughput screening in Drosophila cells. This will be a valuable resource for systematically studying gene functions in fly cells and could serve as a paradigm for those studying other insects were cell lines and genome sequence data are available. Since discovered, Clustered Regularly Interspaced Short Palindromic Repeat (CRISPR)/Cas 9 system has revolutionized genome manipulation of many organisms. Bassett and several other groups have shown that it can be used to efficiently edit genes in Drosophila. The CRISPR/Cas system also works well in mosquito, silkworm and other important insects. Genome-wild RNA interference (RNAi) screens have been hugely successful in Drosophila cell lines (mainly in S2 cells) to identify important gene functions regulating lots of cellular phenotypes. Bassett et al have moved the field forward by generating a genome-wild CRISPR library for high throughput screening in Drosophila cells. An example of an siRNA library being screened for an affect on cell growth. Similar strategies can now be devised using CRISPRs. Bassett et al’s vector for transfecting S2 cells. They optimized the selection and designed synthetic guide RNA (sgRNA) targeting 13,501 genes in fly genome and cloned them into Drosophila cell-line expression vectors. Among these genes, 8989 genes are targeted by three or more independent sgRNAs. For the convenience of transfection and selection in Drosophila cells, they made a cleverly designed vector in which sgRNAs are expressed under the regulatory control of the Drosophila U6:2 promoter, and Cas 9 is expressed using the actin 5c promoter. In addition, they also put a Puromycin selectable marker in the construct to make selection more efficiently. They report a proof-of-principal experiment, using this CRISPR library to screen for genes important for cell survival. 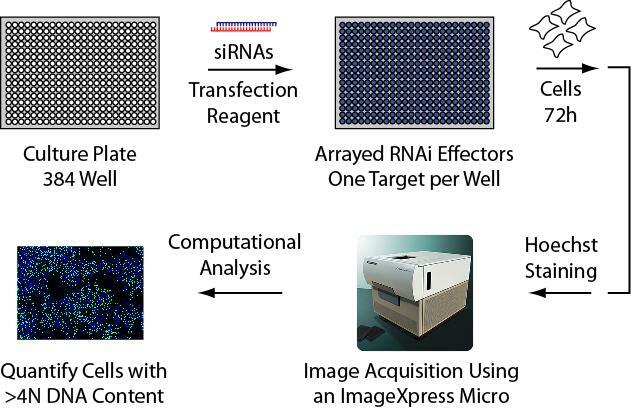 Compared to traditional genome-wide RNAi screen, the advantage of CRISPR library is apparent. One major advantage is that with CRISPR you can create a complete knock out; there is no issue about knock-down efficiency as is the case when using RNAi. However, a possible major drawback for CRISPR is that one may miss genes where a knock out causes cell lethality; and with RNAi one may still be able to observe hypomorphic phenotypes . This powerful system will definitely advance the investigation of mechanisms underlying fundamental cellular physiology. Bassett, A. R., Kong, L., Liu, J.-L., A genome-wide CRISPR library for high-throughput genetic screening in Drosophila cells. Journal of Genetics and Genomics: doi: http://dx.doi.org/10.1016/j.jgg.2015.03.011.